Minions in Blue: The way the Wrecking Crew demolishes the cops in the opening scene suggests “minion” rules should swing both ways (that is, cops are good guy minions to villains, just as thugs and jackboots are evil minions for the heroes). That or, as mentioned before, normals are simply no match for supers and that’s that. One blow from Thor’s hammer sends Thunderball flying into a cargo container, but doesn’t do more than stun him, initially. Thor seems to get one action (attack or counterattack) for each member of the Wrecking Crew who attacks him: Bulldozer charges and gets hit with Mjolnir and knocked away. Piledriver gets some hits in, then gets clobbered. The Wrecker sends Thor flying, but he comes back, and so on. This is the same observation as last week, where Iron Man acted once per Dreadnought he was fighting. Lends more weight to the equal-actions-per-side concept. Wrecker blocks Mjolnir with his enchanted crowbar (how much do you love comic book universes with “enchanted crowbars” by the way?) 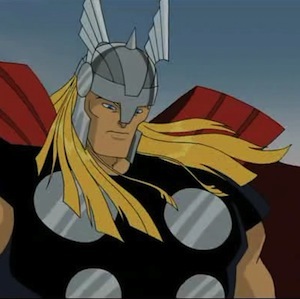 and then knees Thor in the stomach (mainly because this is a kids’ show, I suspect). Maybe some successful attacks or defenses allow for an immediate “follow through”? This would jibe with cases where somebody seems to get the upper hand and just wails on the other guy. After getting a cargo container dropped on him by Thunderball, Thor bursts out and downs three of the Wrecking Crew with one throw of his hammer! He similarly takes down the Wrecker with a single blow (admittedly from behind). Both could be taken as “surprise attacks” which seem to have a lot of punch to them. That, or you could argue the Wrecking Crew had already taken a lot of damage during the fight and this just finished them off. Invisible Cuts: Balder stabs a frost giant in the eye! Ouch! But the falling frost giant shows no sign of having been cut. In fact, several characters in the show employ an “invisible cut” effect: you hear a metallic sound and see the slash or flash of a blade—from Balder’s sword to the Executioner’s axe or Grim Reaper’s scythe—and characters just fall over, but not visibly cut or wounded. Interesting genre application in terms of damage. Thor and the frost giant Ymir clash several times, club against hammer, with no effect other than tearing up the landscape. Stalemate, initially. Interesting to note how their attacks are simultaneous and counter each other. Loki traps Thor in a magical ice prison. He breaks free, but it stymies him enough for the frost giants to get the upper hand and they wail on him for a bit (see the item above about follow-through attacks and actions). However, when Ymir prepares to bite Thor’s head off (!) the Thunderer retrieves his hammer and smashes the giant’s teeth in. Thor calls for a lightning strike that takes down all three frost giants at once. Another example of a limited-use (“encounter/daily”) effect? If he could have just taken the giants all down with lightning, why didn’t he do that in the first place? Well, because he’s Thor, of course, and Thor fights giants hand-to-hand! Still, apart from good roleplaying, why does Thor’s player follow the same course of action, rather than taking the more tactically efficient approach? Or is roleplaying alone a sufficient reason? Loki transforms into a swarm of black moths to evade Thor’s lightning bolt attack. Special defense or just a cool description for some sort of dodge? Substituting his magical power for ordinary defense? How does this work in game terms? Why doesn’t Loki always do it? Loki reforms and attacks Thor from behind, but the cowardly attack isn’t enough to take him down, unlike other surprise attacks. Thor casts Loki aside and deflects his remaining mystic blasts with his hammer. Of course, we later learn this is all part of Loki’s master plan… So it’s hard to determine a comparison, since Loki is presumably “pulling his punches” a bit here. Equal Actions: The concept of each “side” of a conflict (hero and villain) having the same number of actions to divide up seems to play out in various spots and has interesting potential. Take the side with the largest numbers, the other side gets that many actions. So five villains agains two heroes: the heroes get five actions to split up. Six heroes against a master villain? The villain gets an action for each hero who goes. Lots of interesting permutations: Do you “hold” or combine some actions to limit how many your opponent gets? Does this provide heroes with a reason to split up into smaller groups or team up into larger ones? Sneak Attacks: Attacking from surprise or some other stronger position seems to be a big deal. Maybe getting to that tactically superior position is the real challenge of the fight. Maybe a sneak attack bypasses ordinary defense in such a way as to add a big bonus to the attack’s effect (like a critical hit in M&M does, for example). Suspenders of Disbelief: The “invisible cuts” effect suggests that a lot of “realistic” things—like “sharp things cut and wound”—are hand-waved away in the superhero genre, especially in more four-color kid-fare, and that’s just fine (or, if it’s not, you should be prepared to run a different sort of game than the source material).